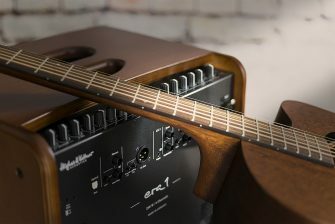 Hughes & Kettner has entered the acoustic world with the release of era 1, a premium 250-watt acoustic amplifier built at the firm’s headquarters in Sankt Wendel, Germany. Designed and engineered in cooperation with Michael Eisenmann – a renowned acoustic amp guru who is the brains behind some of the greatest acoustic amplifiers of all time – era 1 is the truest an amp of this type has ever been to the original tone of the instrument. era 1 offers players richly detailed note definition and a wonderfully responsive, dynamic playing feel. The amp features four channels: Channels 1 and 2 are identical and are equally well suited for either two instruments, one instrument and one voice, or two voices. Channel 3 serves as an input for external audio sources (e.g. smartphones, MP3 players, etc.) and Channel 4 is a superb bus for line-level devices. A powerful EQ section and a comprehensive array of built-in effects allow performers to shape the tone of their instrument(s) and vocals. There are 16 FX in total (including various reverbs, delays, chorus and flanger, and combinations of the various types) and many can be adjusted, customized and saved as presets at will. On the rear panel, era 1 features outputs suitable for any conceivable professional purpose, including a DI output, a stereo Line Out, and an S/PDIF-Toslink optical out.